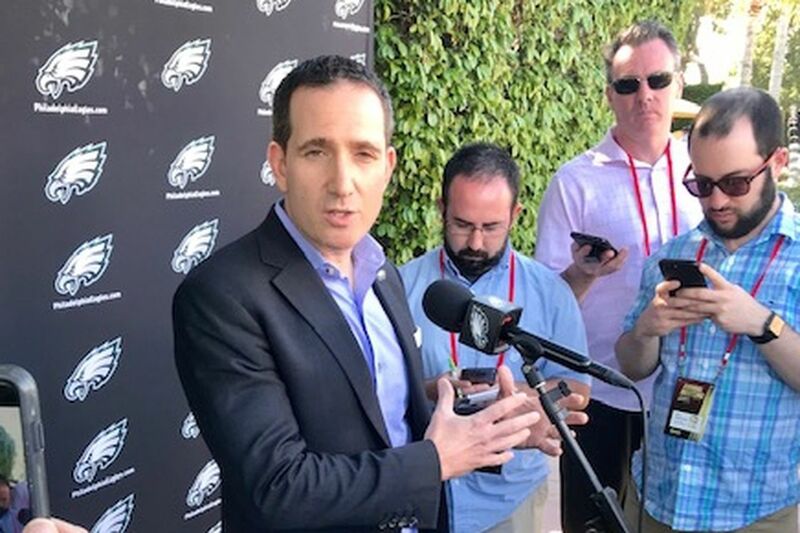 The Eagles didn't sign a running back once free agency opened, but Howie Roseman noted Monday at the NFL meetings in Phoenix that it doesn't mean it's too late for the team to still add one. Now we’re at the NFL meetings, the first phase of free agency is in the books, and the cat is shedding all over the sofa. As Eagles fans have noticed, the team has addressed defensive line, wide receiver, safety, linebacker and even cornerback, probably the deepest spot on the roster right now. But nothing has happened at running back, where Corey Clement is rehabbing a torn ACL, Josh Adams is coming off an uneven rookie season, and Wendell Smallwood is Wendell Smallwood. Oh, and Darren Sproles hasn’t said if he is retired as he approaches his 36th birthday in June. Roseman, speaking in the courtyard of the Arizona Biltmore hotel, had three major running-back points: 1. The offseason isn’t over yet. 2. The Eagles might have gone in to free agency thinking they were going to sign a running back, but other opportunities arose and they took those instead. 3. He likes the returning group, even though the Eagles ranked 30th in the NFL last season, at 3.9 yards per carry. Asked what happens if he can’t improve the group in the month remaining before the draft, if that would commit him to taking a running back in the first few rounds, Roseman indicated it would not. “I just go back to our history over the last couple of years. We’ve been fortunate to win a lot of games with the running backs we have on this roster, and [we] have opportunities, also, to acquire backs not only before the draft but after the draft process,” Roseman said. Roseman, the Eagles’ executive vice president of football operations, seemed to concede that the plan was to sign a running back, when free agency opened on March 13. The Eagles were among the teams linked to Tevin Coleman, who eventually signed with the 49ers for just two years and $10 million – a deal San Francisco can abridge to one year and $3.6 million if it wants. The Inquirer’s Jeff McLane has reported that Eagles running backs coach Duce Staley had Coleman rated tops among the available talent. Even if the Eagles didn’t go into free agency expecting, say, to be able to bring back Brandon Graham (at three years and $40 million) or Ronald Darby (for one year and $6.5 million), Roseman has massaged the salary cap so well that the team currently has $25.9 million available, according to Spotrac.com. Hard to make a case that they couldn’t have afforded Coleman. But another main thrust of Roseman’s session Monday was that all moves are being made with an eye on an upcoming monster deal with quarterback Carson Wentz. Roseman certainly left the impression that he wants to leave a lot of room to try to sign Wentz to an extension this offseason, even though the QB has finished the last two seasons sidelined by injury, and when the 2018 season ended, both sides seemed set on waiting a year to get a clearer evaluation. In 2017, the Eagles signed LeGarrette Blount after the draft and traded for Jay Ajayi in October, something Roseman referenced. “The other thing that’s really important is that we don’t play for six months. We have an opportunity here to continue to improve the football team. And we’re going to do whatever we can to improve our football team,” he said. Asked about Clement and Adams, who both came to the team as undrafted rookies, Roseman unsurprisingly talked them up. Ajayi is a free agent, after suffering an ACL tear last October. Agent Drew Rosenhaus, working the meetings on behalf of his clients, said Monday that Ajayi’s visit with the Colts last week went well, but “nothing is imminent.” He added that he remains in contact with the Eagles. Rosenhaus said he expects Ajayi to be ready for the start of the season, though not necessarily for training camp.